On my previous visit to Rome, I was with a tour group and got separated with the group while visiting the Sistine Chapel, so I was rushed and not able to appreciate what we came for to see. This time I’m staying at my high school friend’s apartment in the northern part of Rome so I’m able to experience the true exuberance of life in this Italian capital: the swirling traffic, the metro, the new bus route caused by a road closure due to a sinkhole, the home-cooked meals, two-hour lunches and very late dinners. However, it does not mean that as a tourist you would not be able to enjoy and get the feel of the city. You just have to plan your visit because Rome, with its extraordinary museums and millennia of history, can be overwhelming. So, when my friend asked why I wanted to go to the Vatican museum again, my answer was because I was rushed the last time. So let me start with the museums. When in Rome expect to find the great masterpieces by Michelangelo, Raphael, and Bernini to be housed in a church. So the church is synonymous to the museum. 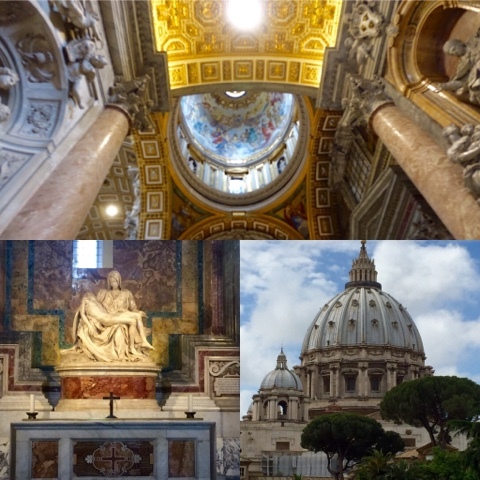 I highly recommend the Vatican Museum and the Basilica of St. Peter (ok the Vatican is a separate state within Rome). Prepare to spend a whole day at the Vatican Museum, as the line alone to get tickets is always long. You can opt to join a tour group that offers ‘skip the line’, but once inside the museum, you have to go with the rest of the people in your tour group, so you will be rushed. And you go along with the rest of the people who waited in line, rushing through a long hallway with a wealth of 12th-15th-century artwork and Renaissance art to head towards the direction of the Sistine Chapel, where the ceiling painted by Michelangelo, stands as the main attraction. When I first visited the Vatican, St. Peter Square was open and we could go in and out of the Basilica. Today, the whole square is barricaded that you have to go through an airport security-like entrance. We wait for 30 minutes to get through security. However, the wait is all worth it. First, by the right side entrance, we find Michelangelo’s masterpiece, the Pieta. Catholic or not, you will be able to appreciate the artwork. I have been here a couple of times and I still get goosebumps just seeing the gilded dome and ceiling, the intricately decorated marble floors and the whole Basilica as an art piece. The Basilica of Santa Maria Maggiore - one of Romes major Basilica, built on the 5th century, rebuilt and renovated on the 12th century; filled with 5th-century mosaic, oldest representation of the Virgin Mary, and where the naves and arches are pieces of art. Borghese Gallery - 17th-century villa filled with the finest sculpture such as Bernini's Apollo and Daphne and Caravaggio's David with the Head of Goliath. The Pantheon - built in 27 BC and reconstructed by Hadrian in the 2nd century, was a temple of Pagan Gods until it was consecrated as a Catholic Church in the 7th century. It is an architectural wonder, with unreinforced concrete dome and only supported by pillars. Piazza del Campidoglio and Capitoline Museum - Designed by Michaelangelo in the 16th century is home to the sculpture of ancient Romans. 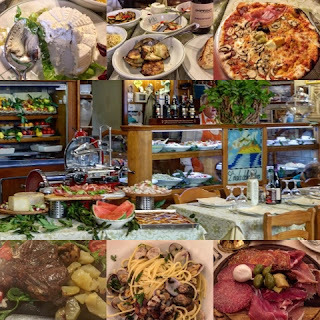 For me, the phrase “When in Rome do as the Romans do” applies to eating. After all, the origin of the phrase had something to do with fasting on Saturday. Most Romans just drink coffee for breakfast, and reserve room for lunch. Eating lunch is an art form. I once ordered a cappuccino during lunch and was told that it was wrong to order a cappuccino during lunch, but the waiter brought it to me anyway. We linger for hours for lunch over a bunch of appetizers, primera, secondi and so on. So you will not be able to do as the Romans if you’re rushed to grab a bite after visiting the museums and other attractions. Avoid the restaurants closest to the museums or tourist attractions. While walking off those calories after lunch, I find a gelato place that offers a free Wi-Fi. We order gelato and sit outside to use the Wi-Fi. I consume the gelato before it melts (a soft gelato that easily melts is a sign of a good gelato), but linger for hours to use the Wi-Fi and do some Instagramming. In Rome and most part of Italy, there’s a gelateria after a gelateria so I cannot recommend the best gelateria. But here are some tips on how to find the best gelato. Do not go to those gelaterias that offer more than 20 flavors. The best ones are those that offer a few flavors like pistachio, melons, almond, cherry, etc. for they are made from fresh ingredients every day. Avoid gelato with intense color. For example, the banana peel is yellow, but the banana gelato should not be made from banana peel. My friend stops by Pompi Bake Shop to get tiramisu before heading home. The tiramisu is served with another dessert at our 9:30 dinner with my friend’s family. In my household in the US, tiramisu is reserved for a special occasion, but here in Rome, it is simply a dessert served with another dessert as part of dinner. They just love eating dessert, especially the tiramisu from Pompi Bake Shop, the best tiramisu in Rome. 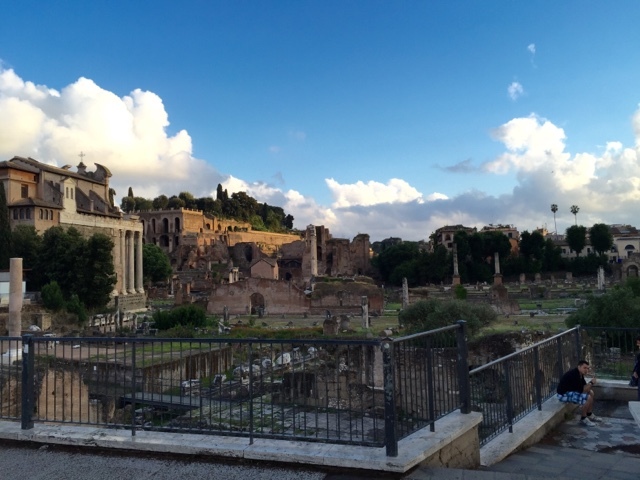 Rome seems like a big city, but everything within the city center is reachable by foot. After parking his car by the Galleria, my friend and I walk a couple of blocks to reach the Trevi Fountain. Closed for eighteen months for cleaning, the Trevi Fountain just reopened, so it's very clean and white, and very crowded. We then walk from the Trevi to Piazza Venezia. where I could see the Coliseum ahead of us, so we decide to continue on to the Coliseum, passing the Imperial Forum and Piazza del Campidoglio. You can join the tour to visit inside and learn a little bit about the history of the place, but another way of seeing the ruins and the glorious structures is to see them from the outside. We walk back to where my friend parked his car before the city lights, the sunset hidden behind the clouds. As a photo enthusiast, it's such a treat to see the natural elements (clouds and sunset) adding drama to "The Glory that was Rome".